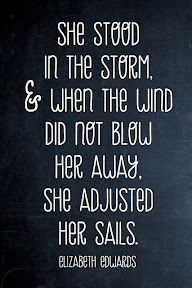 It's apparently taken from a quote, Elizabeth Edwards wrote in one of her books. "In a book excerpt, Elizabeth Edwards wrote of what she hopes her three children will someday tell their own children." "When they are older and telling their own children about their grandmother, they will be able to say that she stood in the storm, and when the wind did not blow her way -- and it surely has not -- she adjusted her sails." This is a quote I want to remember this week. I thought Elizabeth Edwards embodied class, grace and dignity. If I be half of the woman she was during her life, it would be an amazing thing.